June 4, 2016, a charity event #DayForTheFuture took place in the Friendship of Nations Park in Kiev, dedicated to International Children’s Day. Thanks to the organizers of the event—a public organization and Charity Fund “Yedyna Syla”—young kievans and their parents, as well as guests of the capital enjoyed a concert, many interesting quests, trainings and master-classes. 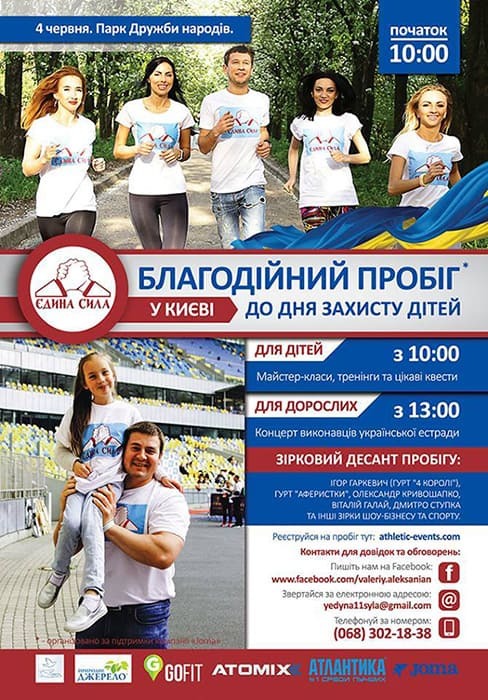 In addition, the #RunForTheFuture race was held to support children’s and youth sports in Kiev. During the event, a fundraising was held to raise money to help children with Down syndrome, who are being raised in children’s homes of the regional centers of Ukraine. The “Pryrodne Dzherelo” brand supported the event by providing the participants with drinking water. “We did not hesitate to take the offer of #DayForTheFuture organizers to join the event, because the concept of the “Day for the Future” corresponds perfectly with the principles of “Pryrodne Dzherelo” brand. Today, the promotion of healthy and active lifestyle among children and young people is very important and needs special effort. We would also like to stress the importance of fundraising for children with Down’s syndrome who live in foster homes. It is no secret that the conditions in many of such institutions are far from the norm, and it’s our duty to help change the situation for the better” — says the PR-director of New Products Group, Elena Selutina. The #RunForTheFuture consisted of three distances: 10 km, 5 km, and 500 m for children. The route was laid through the Friendship of Nations Park and Truhanov Island. After the race, everyone enjoyed the concert by Ukrainian stars, various sports competitions and arts workshops. The families of ATO members were invited to join the celebration.